It’s been a while since we reported on our personal finance so I thought it might be good to put up a quick posting about what we’ve been doing to build our wealth over the past couple of months. In general, we’ve been doing a lot to increase our bottom line. However, this posting focuses more on smaller things that anyone can do to provide a reliable return. So here is what we’ve been up to in the past few months. 1. Lending money. Putting about $25 dollars per month into Prosper.com. If you haven’t heard of prosper, it is basically an online moneylending platform. It links borrowers and lenders who want to either borrow or lend money. I’ve been able to get the account up to $950 which is better than the $600 where it was late last year. 2. Buying stock. I’ve been buying about $200 bucks worth of stock monthly using Stockpile. (They offer dollar trades!) I’ve been acquiring shares in three companies: Disney, Microsoft, and Coca Cola. I like these companies because they all pay dividends, have shown good historical growth, and are in favor by consumers. The brilliant thing about Stockpile is that you can buy shares for as little as $5 bucks, which is great because I’ve been cash constrained over the past couple of months and can only afford to make small transactions. Other brokerage firms aren’t geared towards small time investors so Stockpile has been great for us. 3. Paying off our most expensive mortgage debt. The payments on our first and second mortgages are $2,546.61 and $587.34 respectively. We’ve budgeted $3,500 per month to pay these, which leaves $366.05 extra. We recently allocated the extra money towards our second mortgage which is more expensive than the first one (4.25% vs. 7.5%). It is generally good practice to pay off your priciest debt first and it’s great to watch the mortgage get ratcheted down. 4. We’ve also been periodically shaving the fat from our budget. For example, I’m paying something like $180 dollars per month on my cell phone bill. When the contract expires in 5 weeks we’re going to go with a cheaper family plan – $50 bucks a month. We also called and negotiated a reduction in our cable bill of $60 dollars per month. It’s not a huge savings, but there isn’t any compelling reason to waste money on premium channels we aren’t watching. We’ve also faced high electricity bills this winter, so we’ve just ordered a programmable thermostat called “the Nest” and hope that this will help shave off our hefty power bill. We’ll keep you posted on how well this works out. 1. Our $80,000 second mortgage paid off. I used bankrate.com’s mortgage calculator and it looks like if we continue with our second mortgage pay off rate, we should have the thing completely paid off in ten years. This would be over $80,000 in equity. 2. Just under $34,000 in stocks. Also if we keep investing these smaller amounts, after ten years or so we should have $33,076 (assuming 7% return 3% inflation, a 28% tax bracket). That’s not too bad. 3. About $5,000 in loans we’ve made. If we keep investing in prosper.com, and maintain our current rate of investment, the total after 10 years should be $4,990 (also assuming 7% return, 3% inflation and a 28% tax bracket). So, if we keep this behavior consistently for the next decade we should realize over $119,000, not including the savings on our utility bills. This is enough for a house or 50 acres of land in many parts of the country. Not bad for investing just $600 per month! Strong work, especially on paying off the mortgage! And awesome job on getting a cheaper cell phone plan soon! We’ve really go to look into doing that soon. I think it’s awesome that you’re getting ahead by investing so little. I know the $600/month probably feels like a ton (I’m saving about the same right now). A lot of the FI/PF blog writers always seem to save X,000’s per month, so it’s refreshing to see more reasonable levels of savings, but still driving to FI. Thanks for stopping by and thanks for the comment! 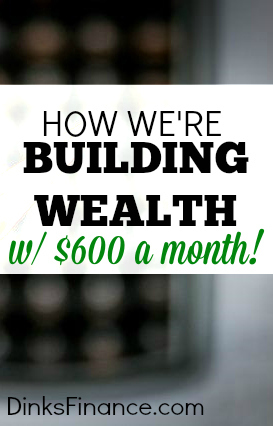 We actually invest as much as we possibly can, but I wanted to show that its possible for people to get ahead even by investing smaller amounts of money. Not everyone has a lot of cash to invest and I think its important that folks realize there are opportunities out there for them. Dee – thanks! No need to pay for all the extra service. Its just a drain on your budget and enriches the telecommunications companies at your expense. We cut cable completely. I already pay Amazon for Prime for the shipping (cheaper as a student) and it comes with Instant Prime and Prime Music. That is $40 a year. Plus many major stations play their shows on their websites. Can you talk more about investing in prosper? Haven’t heard of Prosper! Congrats on the upcoming mobile switch…after we went to Republic I couldn’t believe we had waited so long to do so. Femme – you should check out prosper. I have my loans regularly automatically reinvested there and I’ve been generating about 25 bucks every 5 weeks or so. Its not a lot, but I’m hoping the compounding will take on a life of its own. Pretty much prosper.com is a peer to peer lending platform. People who want to borrow money put in an application through the site. Then potential lenders can access the application and decide whether or not to commit the funds. The minimum transaction is pretty much 25bucks (at least on the lending side), so you can give as much or as little money as you like. You can also make fractional loans – so if someone wants to borrow $1,000, you can only lend $25, you don’t have to commit the whole $1,000. So, pretty much you can easily build up a good portfolio and spread the risk around within the asset class. Peer to peer lending is actually a pretty nice little model. Its also come a long way in the past 15 or so years. There is now sufficient regulation and enough maturity to the market that a lot of major problems with the model have been ironed out. Can you explain Loyal3? I don’t know anything about stocks. If you pay $10, just once what happens? Wow, I’m impressed with the things you do to invest. I’m definitely googling if there are similar options here in Australia. Probably unlikely, though. I’m confused, how is paying off the second mortgage building equity? Is it a second mortgage as in a second home, or a second mortgage on the same house as the first mortgage? Sorry if this is a silly question, but I thought a second mortgage was always a negative thing. I know this blog post is old now but I just stumbled across it on Pinterest. I really like the idea of websites like Prosper.com. I am in the UK so can’t use that service. I also want to look for regional alternatives to loyal3. Thanks for the ideas! Previous post: Tenant Nightmares: Have You Seen My Snake? Next post: How are you planning for retirement? How are your parents? My Dissertations - hire a PhD editor. Myhomeworkdone.com provides help any time of the day, 24/7. 123 Term Papers work hard to deliver you a great term paper.